inserted and glued into foam. 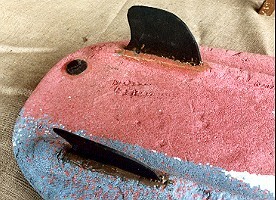 Early 1970's molded polystyrene foam board, an adaptation of the paipo/Surf-o-plane design used principally by juveniles. Advanced models used a molded rubber fin, e.g. Midget Farrelly model. 1980’s models were inserted in a woven fabric cover to limit foam damage. In the 1970's small groups of riders adapted production models, usually by fitting fins, to circumvent beach restrictions e.g. North Bondi.